That’s a pretty awesome way to redirect broken links to your right pages, I don’t see any downside to that. Comment from discussion henriduf’s comment from discussion "I am John Mueller, Webmaster Trends Analyst at Google. AMA.". Unfortunately, there is an issue behind the auto-complete feature of WordPress. The content of those two pages was tremendously different: One was in French, the other one was in English. In this case, the 301 redirect does not match with the idea of a 301 redirect according to Google. According to Google, a 301 redirect should be a 1 to 1 page. The two pages should be similar. I know that people get residual google juice from other URLs to one URL this way. Disabling auto-complete means losing some residual google juice. 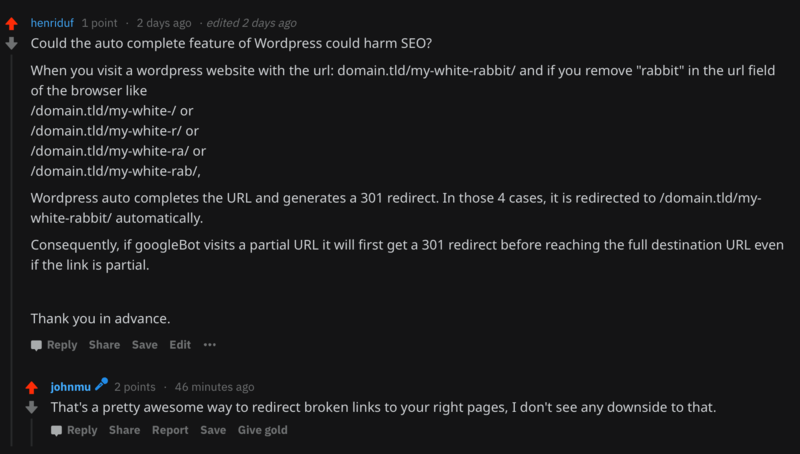 Following the question we posted on reddit we saw a new issue related to the auto-complete feature from wordpress. The two URLs had no keyword and no subject in common. We deactivated all the Htaccess redirects and the Redirection plugin redirects. Nothing changed then, in a plugin. We added the remove_action that we mentioned above. Guess what? The first URL then returned a 404 error page. This means that the auto-complete went crazy and redirected to a page that has nothing in common with the original URL.